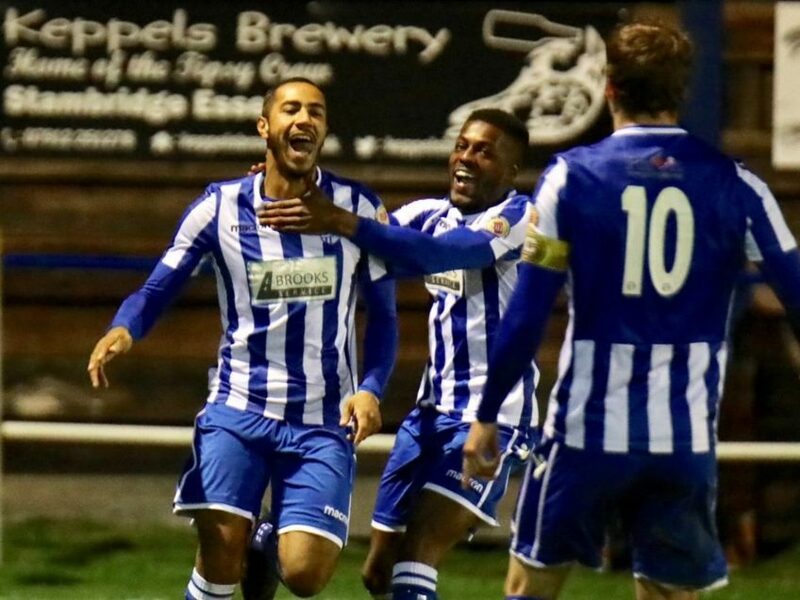 Hullbridge Sports started their Vase campaign with a bang. Exempt until the 2nd Round, Sports were able to despatch Irchester United without too much trouble on the pitch; off it and it was a case of the floodlights almost causing an issue. Luckily that was resolved so Hullbridge go into Monday’s draw thanks to goals from Jimmy Cox, Luke Hornsley and Nathan Scarborough. Ryan Lovell bagged the Irchester reply. Redbridge also go into the hat after a hard fought 1-0 win over Peterborough Northern Star. The Motormen were handed the lead in the 31st minute with a curling shot from Ashley Blackburn that bent round the keeper before crashing into the net. There was to be no further goals, thanks in part to the woodwork, with the crossbar denying the visitors, while the hosts then hit the post late on. Saffron Walden Town end the day 2nd after managing to share the spoils with a Barkingside outfit that came very close to their first win of the season. First blood went the way of the Bloods with Lewis Francis opening the account in the 2nd minute. But Michael Clark levelled up just past the half hour; then handed Side the lead on the hour. Just when it looked like the bottom club were going to claim their first three points, Ashley Skeggs then notched a last minute equaliser meaning both teams have to share a point. Whilst the hosts are at the top end of the table, Barkingside remain right at the foot of the table however. Leyton Athletic remain in the bottom two after they were gunned down by a Marley Okosi double that handed Stanway Rovers a 2-1 win. Dwade James is a constant scorer for Leyton Athletic and he was to notch another goal, but his side remain in the relegation places. As for Stanway Rovers they are now up to 13th and moving further away from the danger zone. Sporting Bengal United are up to 4th after beating Ilford 4-1 at Cricklefield. Jay Knight, Jason Ngandu (2) and Bobby Redwood provided the goals, with Ilford only getting a consolation thanks to a Sporting Bengal own goal. That error aside it has been a steady start for the Bengal Tigers, on course perhaps for their best ever ESL finish. Ilford meanwhile end the day in 9th. 119 people saw the Hertfordshire derby between Hoddesdon Town and St Margaretsbury, which saw five goals in total, with St Margaretsbury taking all the points with a 4-1 victory. Chris Cordara-Soanes handed the visitors a 5th minute lead, doubled in the 51st minute when Frazer John struck. The hosts pulled one back soon afterwards courtesy of Kane Lowe. But Connor Scully then extended St Margaretsbury’s lead, with the game finally wrapped up in the 84th minute when John scored his second goal of the afternoon. Takeley are 6th after a 3-2 away win over Tower Hamlets. Andrew Boehen on 27 minutes; Jason Todd on 32 minutes; and Joe Pullen on 57 minutes is how the Takeley score sheet reads and those goals cancelled out the goals the hosts scored via Darnel Coker and Luke With.